Throughout its 124-year history, WSU has experienced several large construction booms. Over the last 15 years, WSU has built or performed major renovations to nearly 40 facilities on the main campus in Pullman, Washington, causing massive changes to the utility systems. 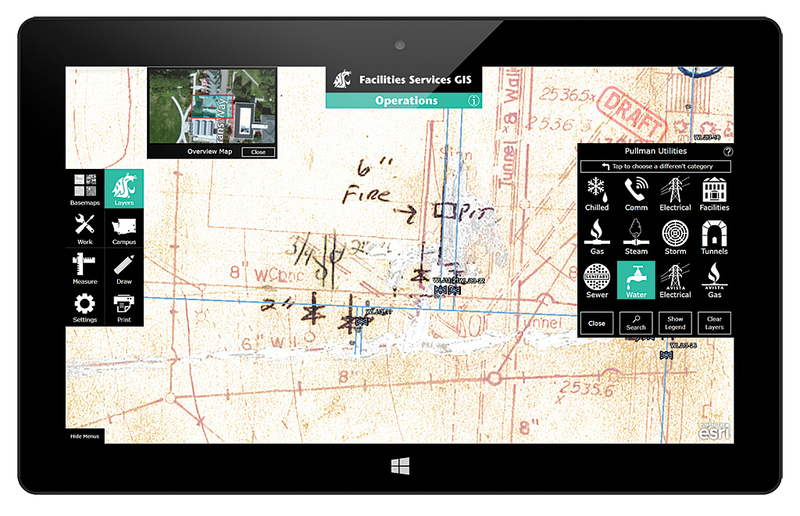 The university’s utility maps became terribly out of date and led to many “surprises” in the field. To get by, crews resorted to creating and redlining their own paper maps. In 2011, WSU Facilities Services was formed by bringing the Facilities Operations and Capital Projects departments together. New leadership and new department priorities opened the doors for further development of the department’s existing GIS. 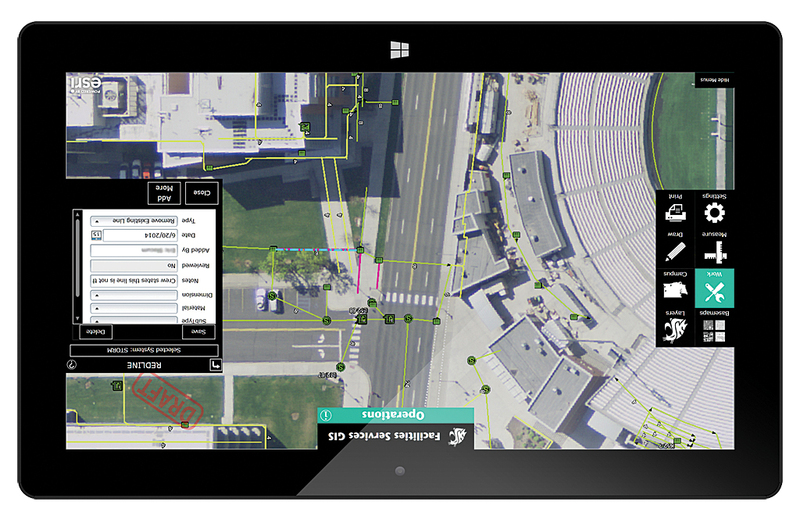 At the time, GIS had been used for tracking university-owned real estate. While utility data was populated in the GIS, it had not been incorporated into the departmental workflow. 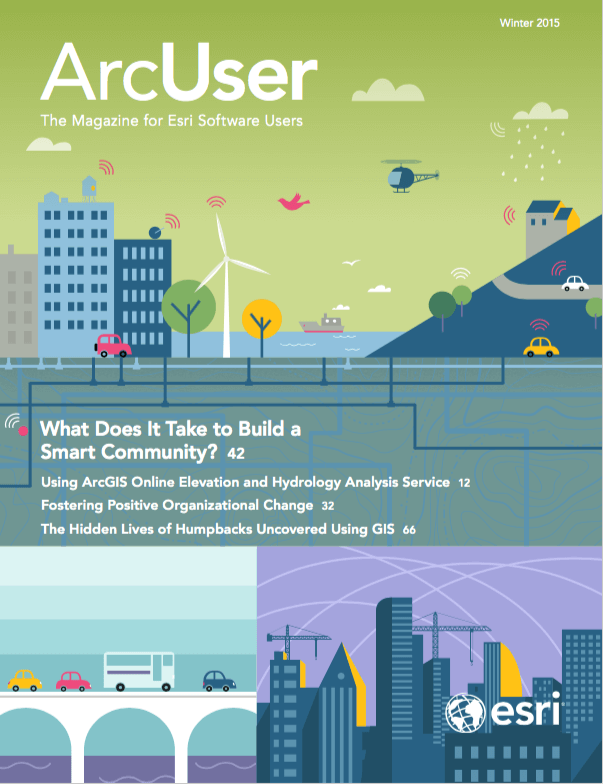 The goal was simple: create an easy-to-use mobile app so that all staff could view and query the same geospatial data as well as contribute information back into the university’s GIS. The menus were designed as a stack of cards located off screen. To transition between menus, clean, fluid animations “fly” the card in and out of view as needed. Using this method had the added benefit of creating infinite scalability because the app isn’t limited to a finite menu content area. If menu content is needed, a new card flies in. It flies out when the user is done with it. App functionality can be continually added without constant reworking of the entire user interface—another bonus. It also makes for an engaging and entertaining user experience. Good design only goes so far when enticing people to use an app. This is especially true when users’ accustomed workflow must be replaced with a new one. In this case, users had kept their own paper utility maps with handwritten markups (redlines) for many years. Showing them an app containing different map data wasn’t going to cut it. Policy changes on how as-built drawings were handled and incorporated into records after a project is completed were a necessary first step for correcting current and future WSU utility data. However, this didn’t address the many decades of sporadic and missed updates to utility maps. Corrections made in the field are called redlines. When a utilities crew member finds a feature in the field that isn’t in the GIS, that feature can be added by simply opening up the Redlines menu in the app, selecting the appropriate utility system, selecting the component to add or remove, and placing the feature on the map. The user can also add attributes to the new feature. It’s an easy, efficient, and effective process. Using this method, 118 features in one system were located and corrected in just four days. What’s more, crews now have the power to make a difference for the whole organization. Washington State University (WSU) was founded in 1890 as Washington State’s Land Grant institution. It operates statewide with four campuses, five research and extension centers, four research and extension units, and one research station. WSU is home to more than 26,000 undergraduate, graduate, and professional students. 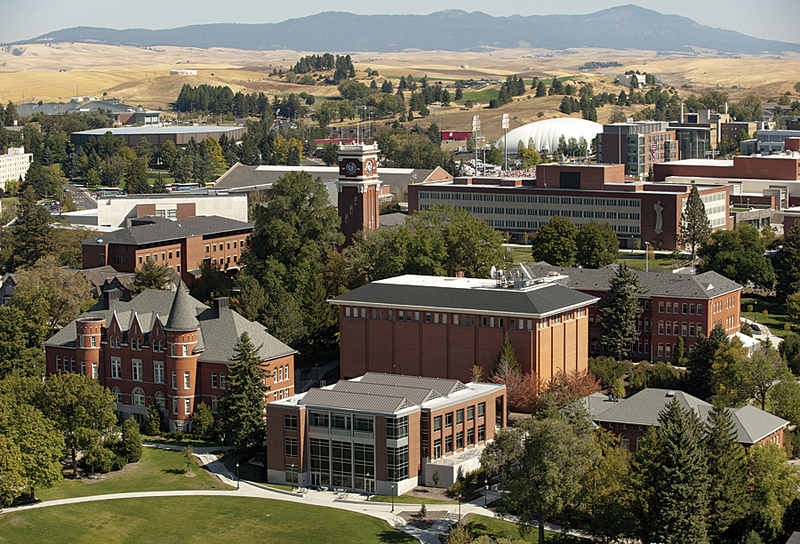 The main campus is located in rural eastern Washington in the small town of Pullman. Due to the size of the main campus, WSU owns and operates its own utilities with the exception of a few natural gas and electrical lines shared with a local utility provider. This adds up to over 70 miles of streets and sidewalks, 43 miles of electrical lines, 22 miles of steam lines, 30 miles of freshwater lines, and more than 6 miles of chilled water lines making WSU—in many ways—its own municipality.